Now, I have to admit that even though I have been to Athens and also to Crete, I haven't really tried Greek food. Although I have tried Baklava and I adore it, especially with pistachio ice-cream *drools*. 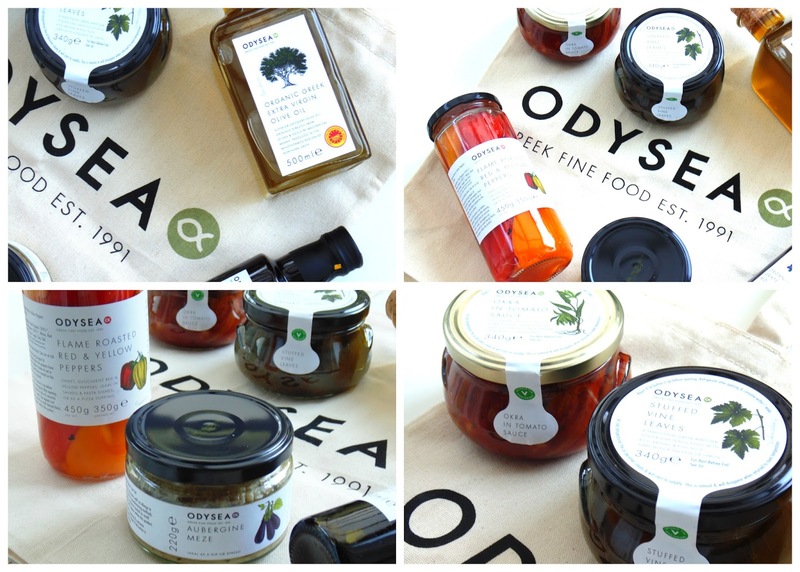 Odysea is a greek food brand, created in 1991, to bring the authentic taste of greece to the UK. They use high quality products from long term producers and the products are based on the greek and mediterreanian diet which is one of the healthiest diets in the world. The products are suitable for vegetarians! The main stockist of Odysea products in the UK is Ocado. *Odysea Organic PDO Mylopotamos Extra Virgin Olive Oil (£6.99, 500ml): Olive oil is supposed to be one of the most important parts of the mediterranean diet and a small study found that the mediterranean diet, with the inclusion of olive oil, helps improve cognitive functions (here). This olive oil is organic and it is actually a protected designation of origin product. While I love the rustic design, the stopper is a bit messy but other than that minor issue, it's fantastic. I've been using it so much as it tastes so nice! They do have a spray version which I will definitely be looking out for. *Odysea Stuffed Vine Leaves (£2.99, 340g): I haven't ever tried stuffed vine leaves, they seem really unusual to me and I thought there would only be a few in the glass container but there were so many as they are quite small. They contain rice, pine nuts, lemon (which all sound amazing) although they also contain raisins which I'm not really a fan of so these were not a massive favourite of mine (they were still nice, don't get me wrong) but I personally wouldn't buy them - however my dad loves them and ate nearly all of them! *Odysea Flare Roasted Red and Yellow Peppers (£2.99, 450g): Now, usually when I write reviews of anything, I have the product or part of the product next to me but these didn't last two days - they were so nice just on there own or on bruschetta (wrong country, I know). I'd definitely buy these, they would be perfect on bruschetta as a starter or a snack. *Odysea Okra in Tomato Sauce (£3.50, 340g): I have to be honest and say that I don't like okra however in this tomato sauce they are much nicer. I definitely prefer it hot rather than cold and again it would be perfect on bruschetta, as a starter or as part of a mediterranean tapas (again, not the right country but it would definitely work). On a side note, the glass containers would be fantastic to re-use for food or small items. *Odysea Aubergine Meze (£2.49, 220g): Another product that I don't have with me because it didn't last a couple of days! I used up most of this as a toast topping which probably isn't the right way to use it but it did taste gorgeous, however it was a little burnt tasting because it too is flame roasted. *Odysea Organic Grape Molasses (£4.99, 250ml): I wanted to try this as I haven't tried anything like it before - it smells amazing, like a rich, thick grape syrup. It is an ancient sweetener that can be used in marinates and dressings as well as cordials. However, I'm going to use mine in a grape molasses spice cake or in a christmas cake/pudding as I think it would work so well in both. If it works out well, I'll definitely share a recipe! Overall, even though this food is quite out of my comfort zone, in terms of what I usually eat, it was a nice and refreshing change. I would definitely recommend the olive oil, flame roasted peppers, vine leaves and aubergine meze especially if you want to make your own greek style tapas. Have you tried anything from this brand? Do you like greek food? Labels: Greek Food, Ocado, Odysea, Snacks.